I’ve been meaning to write this post for ages but hadn’t gotten around to it. And because I took so long Mountain Goat have gone and changed what they write on their cans. See, I was inspired to write the post after seeing this on their canned Fancy Pants (which is a great beer by the way). As you can see, it just features the address of their Richmond brewery. 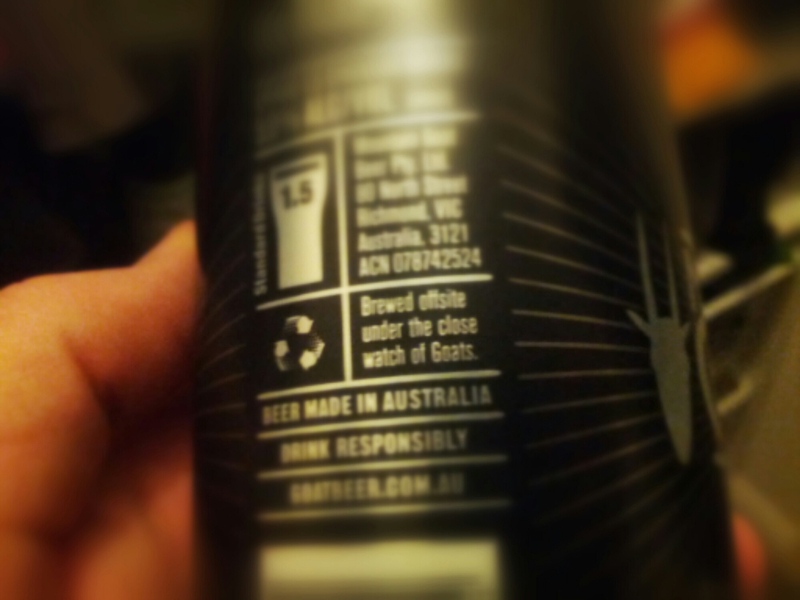 Which is fine – except that’s not where the Goat’s canned product is brewed. As I understand it, the canned beer comes from the Asahi brewery elsewhere in Victoria. More recently they came out with the Surefoot Stout can, which featured some new words on the can. It’s a little bit more information, but really, all it tells us is where it ISN’T brewed. It still doesn’t say where it IS brewed. Now I presume that’s because they fear there might be some negative connotations to be had if they put ‘‘brewed at Asahi’’ on their cans. Not from me they wouldn’t, because I like the Mountain Goat cans (well, with the exception of their Summer Ale. But I freely admit I’m probably the only person on the face of the Earth who didn’t like that beer). And I see absolutely no issue with someone opting for a little contract brewing. If brewing the beers at Asahi makes the cans a possibility, then I’m fine with that. My issue is more with the beer geeks who, in the past have been quite vocal in what I’ll refer to as the War on Terroir. That’s where breweries try and hide the origins or ownership of a beer. It was most famously exhibited in the Byron Bay Pale Lager case, where the labelling made it look like it was brewed on the Far North Coast, when it was actually made 630km away by mainstream brewer CUB in Melbourne. The geeks kicked up a fuss and started a war on terroir. Then they laughed with glee when the ACCC fined CUB. There’s also been vocal complaints that Coles doesn’t put its name on those Steamrail beers or that Woolworths doesn’t do the same with their Sail & Anchor and John Boston range. Most recently, eyebrows have been raised about Coca-Cola not including its name on those Yenda beers as the soft drink company is part of a joint venture behind the Australian Beer Company. Meanwhile, I’ve barely heard a peep from anyone about those Mountain Goat cans. It really weird. It’s almost like we figure being less than straightforward about a beer’s origins is bad when it’s a mainstream brewer, but it’s okay when it’s a craft brewer. Or maybe we don’t say anything because stuff like this doesn’t fit so neatly into the ‘‘big brewers = bad, craft brewer = good’’. It’s the same with tap contracts. Beer fans bemoan the big brewers tying up taps and stopping the little guy from having a shot. But I reckon, if the little guy suddenly got access to some taps, he’d be looking to lock them up too. In fact, I’d be very surprised if some of the ‘‘good guy’’ craft brewers have already done exactly that – but on the quiet. I would just like a little consistency – from the geeks. Because if it’s not okay when the big brewers do it, then it shouldn’t be okay when the little guys do it either. 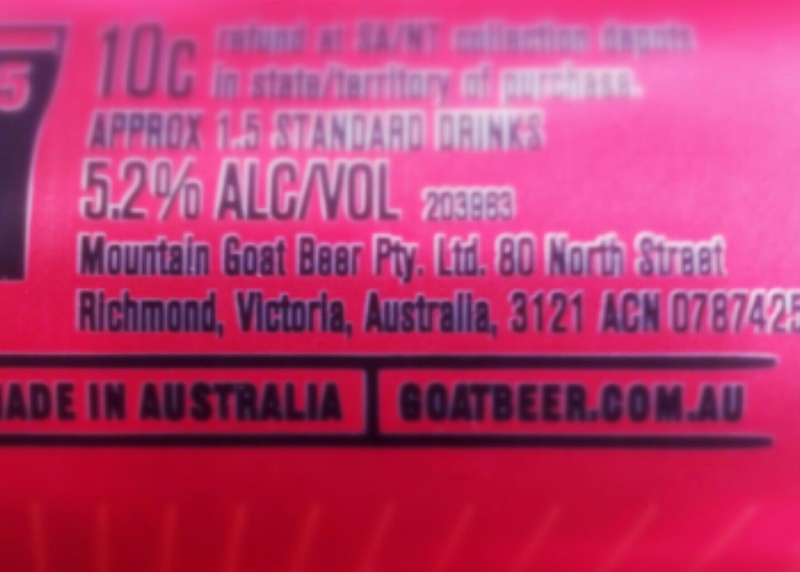 I hate that Mountain Goat aren’t clear where the beer is made, on the other end of the scale you have Newstead which have something like “contract brewed at brewpak” on them. Also I can assure that many craft brewers have tap contracts, deals with bottleshops for premium shelf space etc. Those deals don’t surprise me at all. And if Mountain Goat were open about where the beer is made it would go a long way to eliminating the contract brewing stigma. Outside of the piece in Brews News, I haven’t seen any mention lack of labeling? That’s the only time I can recall seeing anyone saying anything about MG. But there were heaps of coverage of the mainstream brewers doing it. The inconsistency annoys me. I mean in regards to people being upset about it with the cases you mentioned. I’ve seen people discuss the ownership and the products but not so much the labeling (or lack of). In all the beers you mentioned, outside of Byron (which was still different to a regular contract situation), they are also owned by the companies that aren’t mentioned. I don’t have a massive opinion on it really, with a slight lean to the side of transparency in all cases, but I’m not sure people are jumping up and down about the issue while ignoring MG.
Oh, okay. Gotcha. I can recall seeing quite a few comments on social media criticising Woolies, Coles and Coke for not being open about being behind those beers. Ultimately I don’t care too much about where a beer is made either. What prompted this was more the fact that there seemed to be a double standard in operation. Isn’t it a bit unfair to say that this is “the geeks” as a generalisation then? Tarring everyone with a double-standard brush? There is a bad enough image problem for beer geeks as it is so it’s always a shame to see articles/posts saying “all the beer geeks do X” when there isn’t really any evidence. It’s a bit of a strawman argument. I don’t think I’m tarring everyone with the same brush. Just referring to those who I saw complain about the mainstream brewers doing it. As I state at the start of paragraph seven – not “all beer geeks” but “those beer geeks”. And I’ve seen people make these complaints so it’s definitely not a strawman argument.